To better understand the impact of indoor air on our health, we need to consider the amount of air we breathe per day. An average person consumes 2 kg of food and water per day – but breathes in 15 kg of air per day (12 000 litres). The health impact is thus clearly important (Nilsson, 2008). 90% of our time is spent indoors, so most of the air we breathe comes from indoor environments. 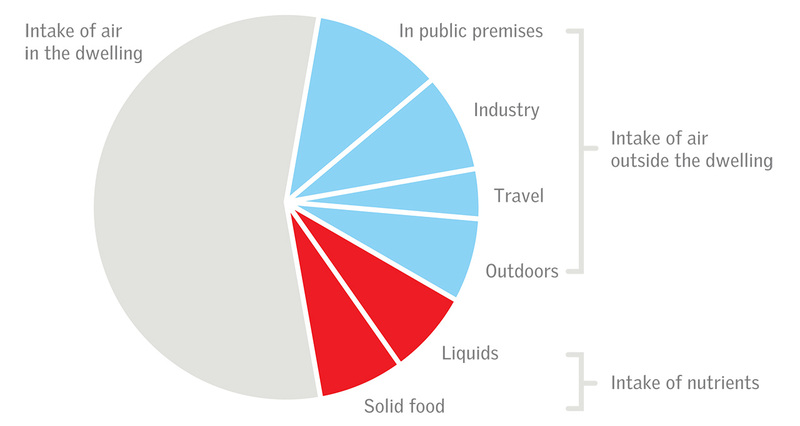 And we spend a lot of time in our homes – 55% of the total intake of food, water and air during a lifetime consists of indoor air from our home, see in Figure 2.2.1 (Sundell, 2004b). The individual or combined effects of the many compounds in indoor air on human health are not fully understood, but major research studies have shown that indoor air quality has an important impact on the health of humans in buildings. ​Figure 2.2.1 55% of the total intake of air, for a person is indoor air from our dwellings (Sundell, 2004b). Professor Jan Sundell of the International Centre for Indoor Environment and Energy at DTU (the Technical University of Denmark) says that “we do not know much about causative agents in indoor air, but there is mounting evidence that the indoor environment, especially dampness and inadequate ventilation, plays a major role from a public health perspective, and that the economic gains to society for improving indoor environments by far exceed the cost”. In Northern Europe, especially, asthma and allergy are becoming more and more common among children. This phenomenon has been studied by doctors and indoor environment scientists. One study investigated the prevalence of these illnesses among Swedish conscripts. 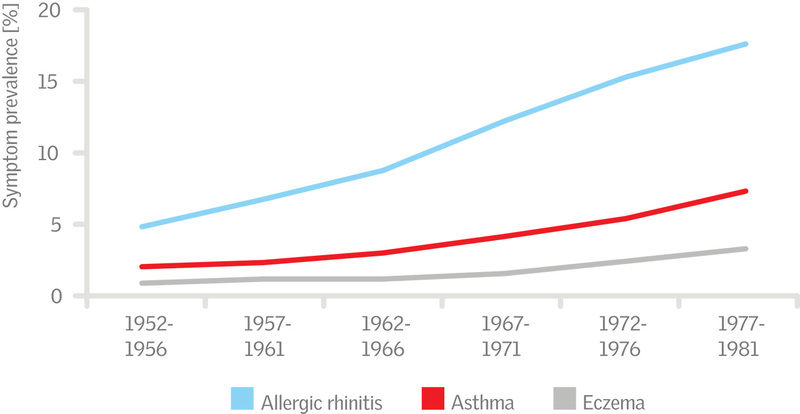 From the 1950s to the 1980s, a large increase in the number of persons with illnesses like asthma and allergy (prevalence)was recorded - see Figure 2.2.2. The trend has taken place too rapidly to be explained by genetic changes and must be attributed to environmental changes instead. No direct link to indoor air quality has been found, but most researchers recognise that a link exists (Bråbäck et al., 2004). To emphasise the importance of healthy indoor air, the World Health Organisation (WHO) has adopted a set of declarations on “The right to healthy indoor air” (WHO, 2000). Figure 2.2.2 The prevalence of allergy, asthma and eczema among Swedish conscripts (young men who join the armed forces) (Bråbäck et al., 2004). The term Sick Building Syndrome (SBS) is used to describe situations in which building occupants experience acute health and comfort effects that appear to be linked to time spent in a building, but where no specific illness or cause can be identified. The complaints may be localised to a particular room or zone, or be widespread throughout the building (Franchi et al., 2004). The symptoms of these problems include headaches, eye- nose- or throat irritation, dry cough, itchy skin, fatigue and concentration difficulties. These symptoms are defined as SBS symptoms, and WHO concludes they are found in 15-50% of all buildings (Krzyanowski, 1999). A review showed that air-conditioned office buildings have a 30-200% higher prevalence of SBS than naturally ventilated buildings (Seppänen and Fisk, 2002). The symptoms are believed to be caused by poor indoor environments and can be helped by improving the air quality. 50-100 years ago, the houses in most of Europe were often leaky, which meant that their ventilation rate was often in the range of one air change per hour (ACH) without open windows. This led to high heating demands and the building codes have been focusing on reducing leakages since the 1960s. Measurements show that infiltration has been reduced, as illustrated by Figure 2.2.4. Figure 2.2.3 The prevalence of allergy, asthma and eczema among Swedish conscripts (young men that join the armed forces). Infiltration is the uncontrolled ventilation through leakages in a building, a measure of the airtightness of a building. 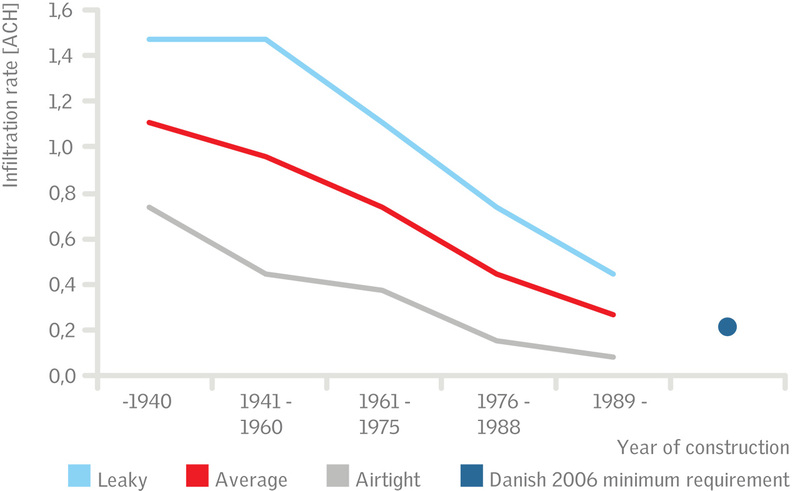 Increased airtightness provides better energy performance, but buildings in Northern Europe today are generally so airtight that infiltration alone is far from sufficient to provide reasonable ventilation and good air quality. Consequently, building occupants need to actively ventilate their homes to achieve good air quality and a healthy indoor environment. It is important that the VELUX ventilation flap is used to ensure a reasonable background ventilation rate, and particularly that airings are performed several times a day. Children are particularly vulnerable to poor air quality, as was seen in section 2.2.1. Living or working in damp buildings are among the indoor air quality factors that are most likely to cause illnesses. Investigations thousands of houses have shown that damp buildings can cause illnesses such as coughs, wheezing, allergies and asthma. A damp building is a building with an increased humidity level (the exact risk level of humidity is not known). Figure 2.2.4. is an example of the effects of damp buildings – it shows how dampness increases the risk of allergy (Sundell, 1999; Wargocki et al., 2001). Human activities such as cleaning, cooking and bathing add moisture to indoor air, resulting in the air indoors containing more moisture than the air outdoors. The activities of a family of four typically add ten litres of water to the indoor air – per day (British Standard, 2002). ​Figure 2.2.4 Shows the amount of condensation seen on the inside of bedroom windows and how this affects the prevalence of allergic rhinitis among children living in the houses (Bakó-Biró and Olesen, 2005). It is important to notice that condensation is an indicator of dampness in the room; condensation on the window pane is, by itself, not problematic for health (Wargocki, 2011). The moisture production from a typical family is 8-10 litres per day – this corresponds to emptying a large bucket of water on the floor every day. It should be removed with adequate ventilation to reduce the risk of illnesses. There is no clear scientific explanation of exactly how dampness has an impact on health. It is well- known, however, that house dust mites thrive in humid indoor environments. House dust mites are a well- known cause of allergy, and to reduce this risk, the relative humidity should be kept below 45% for several months a year (Sundell et al., 1995). The ventilation rate is a compromise between energy demand and a healthy indoor environment. In Figure 2.2.6 we see that high ventilation rates could improve human health. 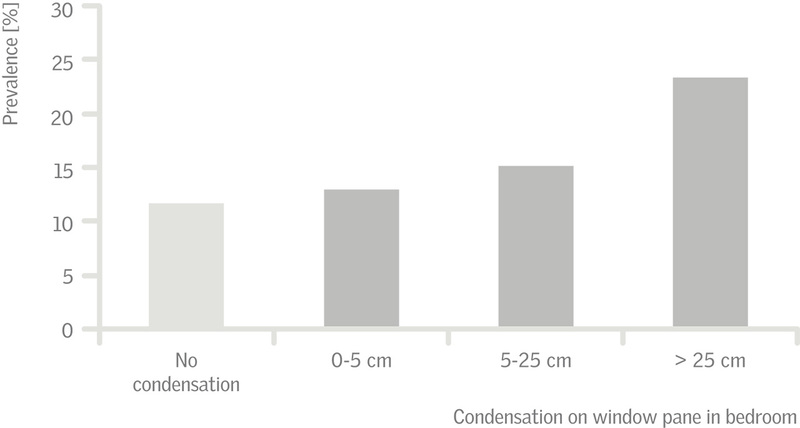 But high ventilation rates also increase the heating demand in climates with cold winters as shown below. 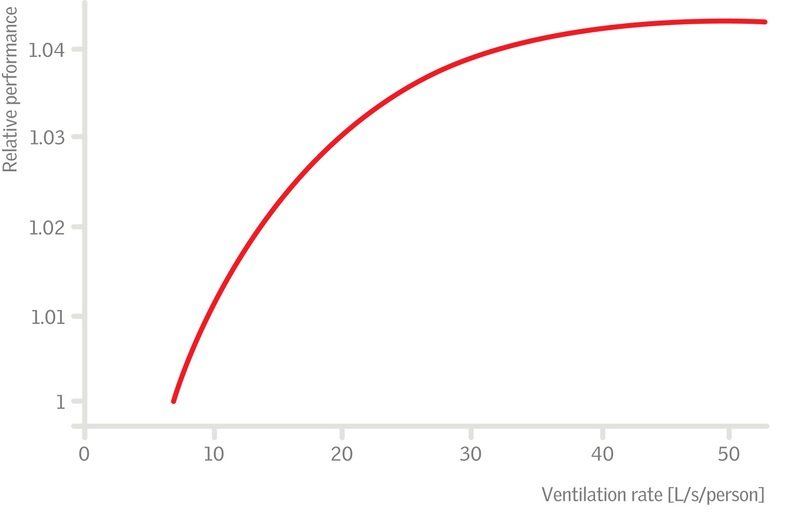 ​Example: effect of ventilation rate on heating demand. 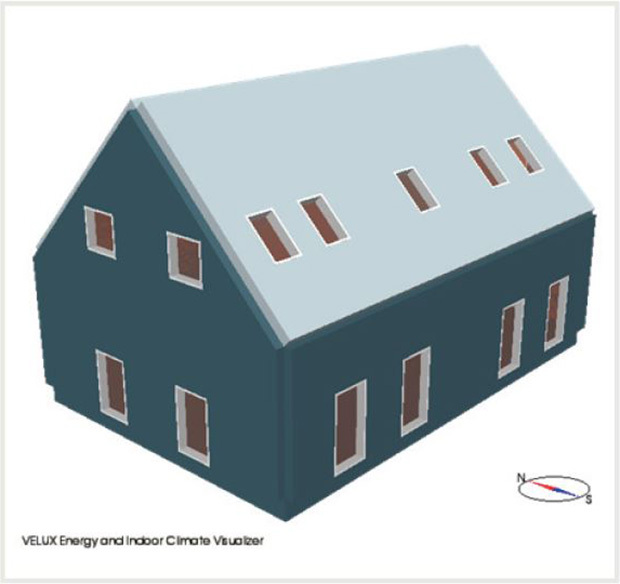 A house in Stockholm, Sweden, is investigated with VELUX Energy ad Indoor Climate Visualizer. The heating demand is determined for a ventilation rate of 0.5 and 0.7 ACH. The heating demand rises by 21% when the air change rate is increased from 0.5 to 0.7 ACH. Figure 2.2.5 Heat demand at 0.5 and 0.7 ACH in a house in Stockholm. The ventilation rate is an indicator of how frequently the indoor air is changed in a house. If the ventilation rate is below 0.5 ACH, as typically required in the North European building legislations (Mathisen et al., 2008), there is an increased risk of becoming ill with dampness-related illnesses such as asthma and allergies, as seen in Figure 2.2.6. ​Figure 2.2.6 The odds ratio is an expression of probability. The figure shows the risk of becoming ill with asthma. 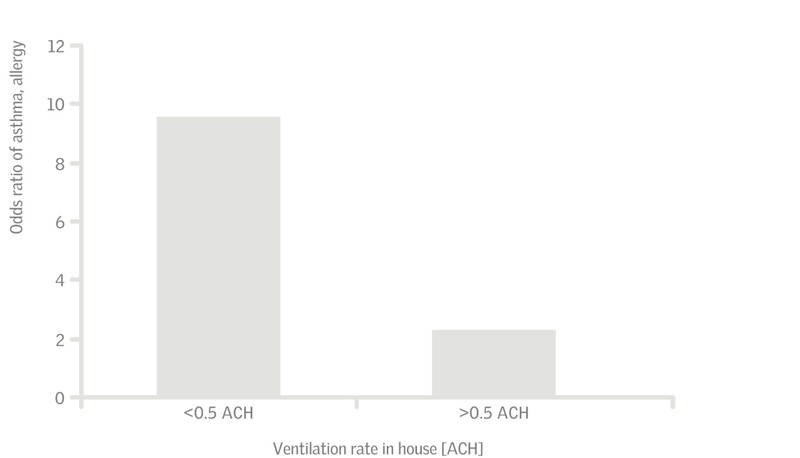 Allergy increases in houses with a ventilation rate below 0.5 ACH (Öie, et al., 1999). Good indoor air quality is a precondition for preventing important illnesses like asthma and allergy, especially among children. There are many important issues in ventilation science other than the strictly technical. There is the basic human need for access to ventilation. Scientific work shows that ventilation with windows or ‘fresh air from the outside’ is not about ‘fresh’ or ‘air’, but rather deals with the notion of creating a ‘good indoor environment’. Something that obviously involves many other aspects than fresh air. The subjects of the different aspects of fresh air are typically divided into three main elements; a functional (practical), an aesthetic (bodily and sensory) and a social (care and impression management) element. The functional element is related to practical pursuits, like airing out after bathing, washing the floor and doing the beds - but also being able to act in dialogue with the weather and the house itself. The aesthetic element includes both a bodily and sensory perspective. Factors like regulation of body heat and being able to smell oneself are important. Not only the odour backdrop (good, fresh smell) in the house from activities, but also the enjoyment of a breeze in the home. The social element deals with the strong wish to be in control. Showing concern for your family’s health by airing your home, enjoying the feeling of freedom by being able to open the windows – but also letting in the sounds and scents from outside. Three very important aspects that all deal with non-technical issues show us that openable windows are a necessity for the indoor environment on many human levels. Another human aspect is the ability to open the window in the transition periods of our everyday lives – like coming from work to home, going from sleep to waking up or returning home from vacation. Routines and unreflected actions are a part of the transitions – and here opening of windows has been shown as one of the actions that we need to perform. Bakó-Biró, Z. and Olesen, B. W. (2005) Effects of Indoor Air Quality on Health, Comfort and Productivity Overview report, International Centre for Indoor Environment and Energy, Technical University of Denmark. Bråbäck, L,, Hjern, A., Rasmussen, F. (2004) Trends in asthma, allergic rhinitis and eczema among Swedish conscripts from farming and non-farming environments. A nationwide study over three decades, Clinical and experimental allergy, vol. 34, no. 1,pp. 38-43. British Standard (2002) BS 5250: Code of practice for control of condensation in buildings. Franchi, M., Carrer, P., and Kotzias, D. (2004) et al., Towards healthy air in Dwellings in Europe, European Federation of Allergy and Airways Diseases Patients Associations. Krzyanowski, M. (1999) Strategic approaches to indoor air policymaking, WHO European Centre for Environment and Health. Mathisen, H. M., Berner, M., Halvarsson, J., Hansen, S. O. (2008) Behovsstyrt ventilasjon av passivhus – Forskriftskrav og brukerbehov, Proceedings of Passivhus Norden. Seppanen, O., Fisk, W. J. (2002) Relationship of SBS symptoms and ventilation system type in office buildings. Indoor Air, 12(2), 98–112. Sundell, J., Wickman, M., Pershagen, G., Nordvall, S. L. (1995) Ventilation in homes infested by house-dust mites, Allergy, vol. 50, no. 2, pp. 106-112. Sundell, J. (2004b) Varför behöver vi bra ventilation?, Nordbygg. Öie, L., Nafstad, F., Botten, G., Magnus, P., Jaakkola, J. K. (1999) Ventilation in Homes and Bronchial Obstruction in Young Children, Epidemiology, vol. 10, no. 3, pp. 294- 299.